For the last twenty years, Mattie Rhodes has been the heart of Dia de los Muertos celebrations in Kansas City. Festivities are held in the historic Westside neighborhood, home to many of Kansas City’s Latinx residents. It began in the classrooms of the Mattie Rhodes Art Center where children worked on Dia de los Muertos themed projects after school. It was in one of those classrooms that Richard Bay, a local artist and art educator in the Kansas City Public School District, held a discussion night about the holiday where an impressive crowd gathered to learn about its traditional practices. The people’s interest was apparent, as was the need for more space, and thus a gallery was opened next door in order to foster a space for cultural and artistic education. 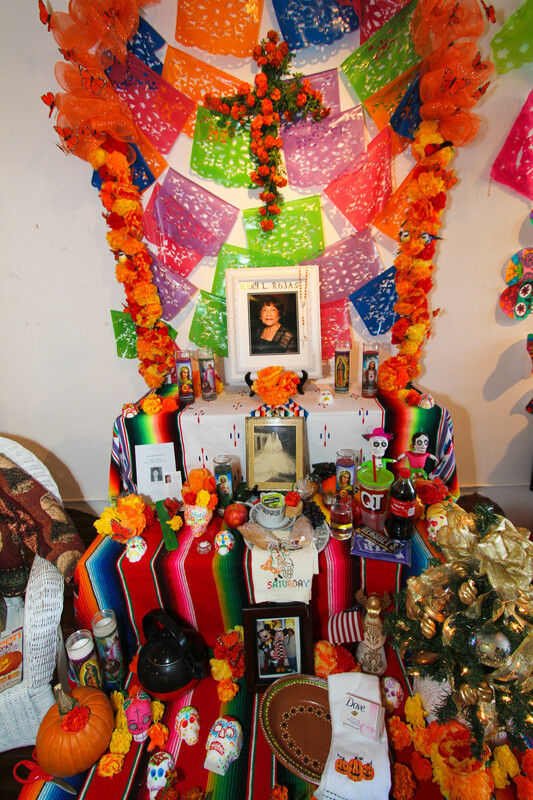 Since then Mattie Rhodes Center has dedicated itself to this idea and hosts a variety of events during Dia de los Muertos, including an altar exhibition made for and by members of the community, cultural workshops and tours, and related celebrations in the streets of the Westside. Altogether, we hope to create an experience that is similar to and honors the traditional celebration of Dia de los Muertos in Mexico. 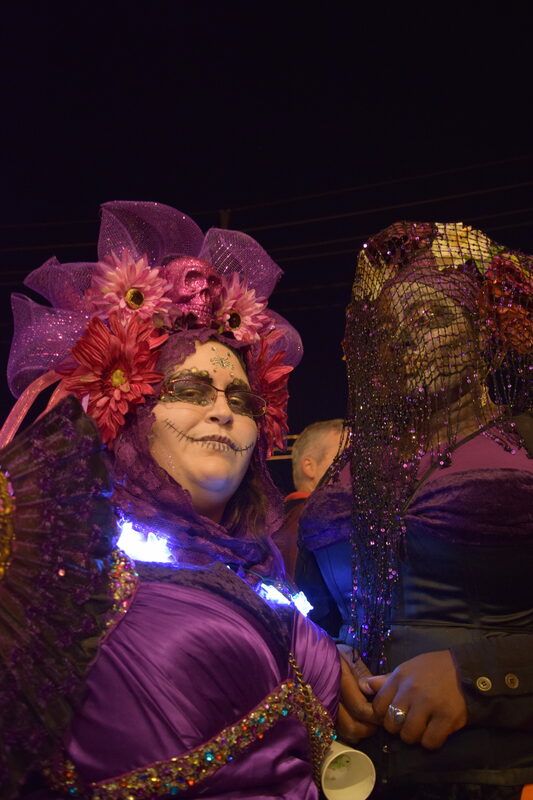 The holiday of Dia de los Muertos varies from place to place, from person to person. The holiday originates in Mexico, though it is celebrated in many other countries in different forms. Dia de los Muertos embodies themes from both All Saints and All Souls Day (Catholic holidays) and those of the Aztecs and the Mayans. The culminations of these many beliefs focus on families reflecting upon those who have passed and rejoice in the happiness they once shared. Even though families are saddened by a loved one’s departure, they do not cry on the Day of the Dead. The elders say the road back to the world of the living must not be made slippery by tears. El Dia de Los Muertos evokes happy and sad emotions, but it is always a celebration that unites the living the dead together for a short time. The holiday can be seen as practice in which we laugh at death, we triumph over it by celebrating life. While Halloween focuses on scary images of monsters, witches and other frights, the Day of the Dead displays a strong sense of respect and love for family, ancestry, and community. Death is a natural part of life, and this holiday allows people to talk and laugh about death and lose some of their fear. Although traditionally Dia de Los Muertos is celebrated on November 1st and 2nd, many people celebrate the days of the dead from October 18th through November 9th, with each day dedicated to different groups of souls, also including a thirteen day feast. 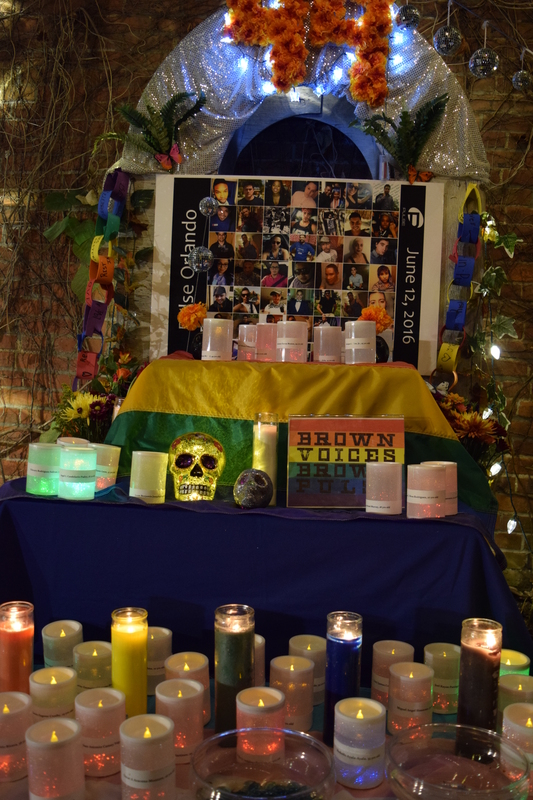 For this celebration of life and death, ofrendas (altars) are constructed for those who have passed and people tell stories and reflect on the good times they all once shared. There are many standards for the creation of the altars. Specific items are called for, the inclusion of the four elements (earth, wind, fire, and water), a towel and bowl of water, a cushion or chair, photographs, candles, flowers, personal items and even food. Our exhibit of altars and artwork displays and explains these aspects and brings others to the surface. Some work portrays the traditional aspects of the day of the dead, while others reflect contemporary views that push the principles of ofrendas. They also present many different views to the public, some dedicated to family and others purely aesthetic. The artwork of various local artists on the walls stirs up the celebration and positive energy that the holiday exudes. The fiestas take you right to the heart of Mexico with the parade, performers, live music, food, activities, marketplace, and art that involve the entire community. The workshops teach you how to decorate and prepare for the festivities, and the slide presentation shows you first hand accounts of the holiday in Mexico. Overall, we bring you many ways to learn, understand, experience and celebrate this wonderful and uplifting Mexican holiday. Many people witness the holiday of Dia de los Muertos on November 1st and 2nd, All Saints and All Souls Days. In some areas of Mexico the holiday begins as early as October 18th and lasts through November 9th. Although the days change from place to place and family to family, the basic festivities remain the same. Below is a calendar of the days of the dead from many areas in Mexico. October 25th- The Feast of the Holy Souls. This is the beginning of a 13-day feast of the dead for the Tzeltals of Mexico. Here graves are decorated with pine needles and tusus (yellow wildflowers). October 27th- The souls of those who have no living family members are offered breads and water from jugs on this day. October 28th- On this day the accidentados return (the souls of those who died in accidents). This is also the day for the souls who have caused great harm or murder to return. They are also offered jugs of water and breads. These souls are un-forgiven for their acts, so their offerings are placed outside the houses or in the corner of a church. October 30th- The unbaptized souls return on this day. The children who visit on this day are known as Los Ninos Limbos (children who died before baptism). October 31st- Angelitos (the souls of children) show up on this day and must return to the land of the dead by afternoon of the following day. Toys and candy are left for them. November 1st- The souls of the dead adults return today. Cigars, cigarettes, alcohol and liquor is left out for the adults only on this day. The adults may remain until the next day. Many families spend the night in the cemetery to spend time with them. This day is known as All Saints Day, a Catholic festival day. Someone is called to ring a bell through town or in the church to summon the souls of the adults. November 2nd- Known as All Souls Day, another Catholic festival day. This day focuses on the living assisting the dead in their move into Heaven. This is usually the last day of celebration and includes the largest fiestas. By the end of the day, all the souls must leave, and to help them along, the mummers (dancers) wear costumes and masks and run through the streets dancing and singing, trying to scare the spirits back to the land of the dead. November 3rd- The living may share and eat the objects from the altar. People usually give their objects to their neighbors saying, they were left for them by the souls. In Mixquic, a bellman rings a bell on the hours of each day of the dead to announce the different happenings and rituals to be performed. The Aztecs dedicated an entire month to the dead. The month was called Miccailhuitontli, and was named after and presided over by the goddess Mictecacihuatl, who was the Lady of the Dead. This happens from July 24th through August 12th. During this month, rituals were dedicated to her and the god of war known as Huitzilopochtli. This was the time of the harvest and it was believed that the souls followed the scents of the harvest in order to find their way to their altars. Every year during our DOTD celebration we have an accompanying art exhibition that features works from local artists and abroad that have created work inspired by Dia de Muertos. Please contact the gallery at 816-221-2349 for more information about how you can purchase a piece from this year’s exhibit. Keep an eye out for the next round of celebrations at Mattie Rhodes, and if you want to get involved, contact the gallery to volunteer, submit your work, or ask about creating an altar.